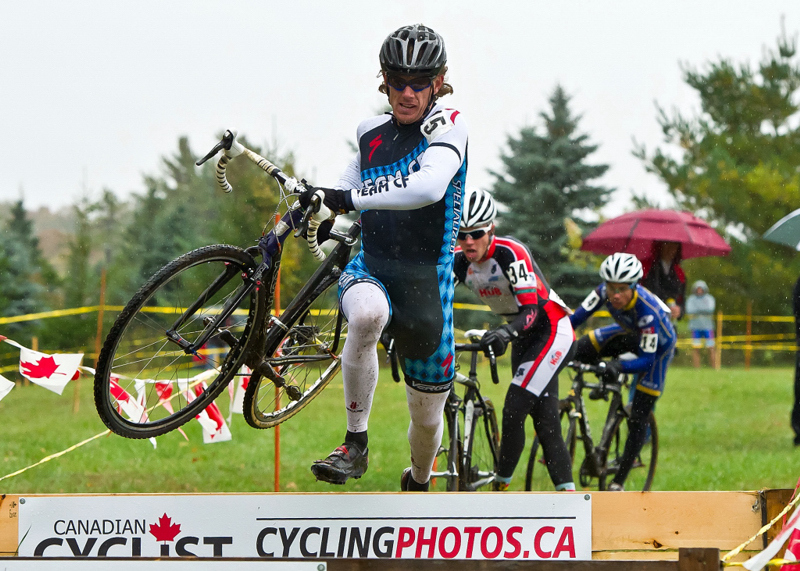 Veteran ‘cross racer Nathan Chown took advantage of Jared Stafford’s misfortune to win the Senior Men’s division at the fifth annual Hillbilly Hustle Cyclocross race, held at Highlands Nordic ski area. Amanda Sin led the Senior Women’s field from the start and dominated to reclaim the Hill Betty skirt she last wore in 2009. The Collingwood resident plans to contest the National Cyclo-cross championships before indulging in any downtime. Julie Marceau (Lap Dogs) and Briana Illingworth (True North) rounded out the podium. Conditions during the women’s race were cool and windy, with the twisty course nicely tacky, allowing for fast cornering. The weather changed just prior to the Senior Men’s race, with a steady rain combining with the cold air to create challenging conditions. 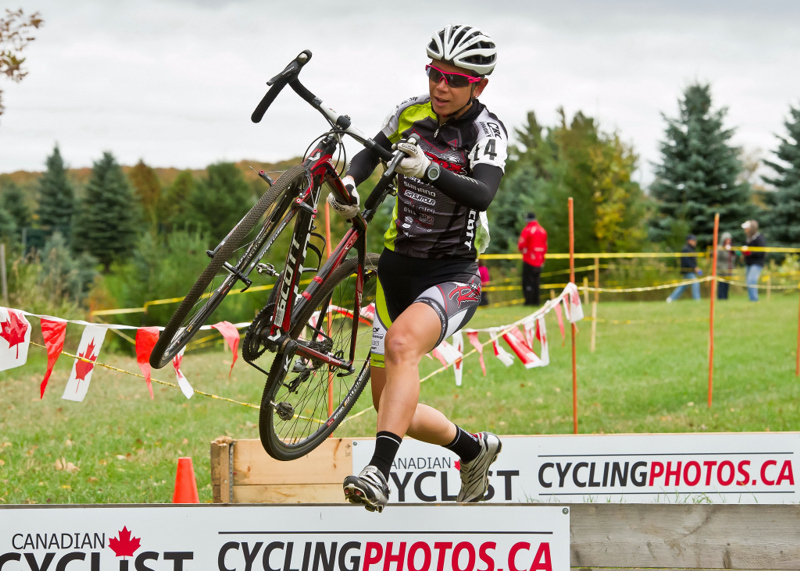 With Belgian ‘cross music serenading the starters, Stafford (Norco Factory Team) and Chown (Team CF) quickly created a gap over the field as they raced for the $100 awarded to the first rider to the barriers. Chown had a minor fall approaching the double barrier, allowing Stafford to take the prime and establish a small but relatively comfortable lead. The 20-year old Newmarket resident appeared to be in control and on his way to victory until about halfway through the race when he rolled his rear tubular on an off-camber turn. Quickly shouldering his bike, he was forced to run 500 metres to the pit area to switch bikes, during which time he was passed by both Chown and Zach Hughes (Norco Factory). Under way again, Stafford was unhappy with the tire pressure on his replacement bike, and paused to release a bit of air. According to Stafford, the sudden stop caused his muscles to “lock up”, and he could no longer control his bike properly, and decided that withdrawing was the proper course of action. “As long as I was going hard I was fine, but that issue with the tire killed me” he commented post-race, while still noticeably shivering. The Senior Men’s podium was rounded out by Simon Wagler of Two Wheel Express. Four-time Hillbilly Hustle winner Andrew Watson made a brief appearance in order to return the Hillbilly Jacket, but did not take part in the race.